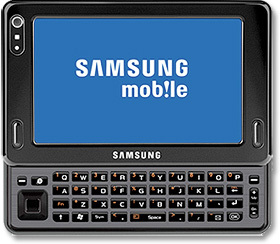 Although it is not official, Samsung today disclosed its WIMAX-enabled SWD-M100 Mondi mobile device for mobile enthusiasts’ attention. The SWD-M100 Mondi features a touch-screen, a full QWERTY keyboard, a directional pad and a few function buttons for quick access. Samsung revealed that the Mondi utilizes Clearwire’s Mobile WiMAX network (Clear network) is suitable for internet access. At first glance, this WIMAX-enabled device is quite similar to the Nokia N810 Internet tablet. The Nokia N810 Internet Tablet also comes with a sleeker design with a full slide-out QWERTY keyboard. The shape and size for both devices are quite similar. However, the overall the performance for the Nokia N810 Internet Tablet is commented sluggish by users. It is interesting to know whether Samsung and Clear will tackle this shortcoming and offer users an improved service and facility. Both Samsung and Clear do not announce further the date of release and pricing of this gadget.